What if the rules we’ve been taught to live and build our careers and companies around were no longer valid? A heavy and scary question for some that could mean the complete overhaul of how we look at life as we know it. This week, Young PR Pros hosts, Kristine Simpson and Julia Kent, explore the new life rules with Mitch Joel. 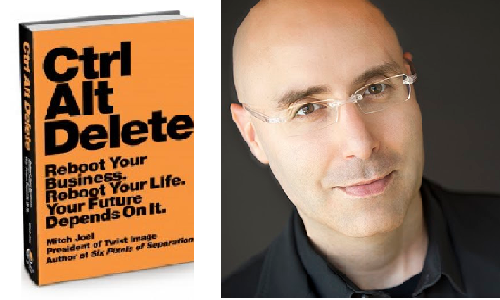 Mitch is the author of Control Alt Delete: Reboot your business, Reboot your life, Your future depends on it. Mitch, named the Rock Star of Digital Marketing and one of North America’s leading digital visionaries, is also the president of Twist Image, one of the largest independent digital marketing agencies in North America. We start the episode off by taking about how the way we work and do business is moving faster than most of us can follow. Mitch offers his insight in to how we can navigate and adapt to the fundamental changes in society today. As a follow up to a question Gini Dietrich asked in an Inside PR episode, where Mitch shared a story about a professional who had it all – the American/Canadian dream – yet she was not happy, Kristine asks if the “American” or in our case the “Canadian” dream dead, what should young professionals do when starting out their careers? Mitch offers some great advice, most notably, don’t think linearly. In today’s career landscape, the average professional might have five to six career changes in a lifetime. This should not be scary, says Mitch, but an exciting new way to experience lots of different opportunities. Then we switch gears a bit. Julia asks Mitch about the experience of writing a book. A fascinating tale of unique surprises and hard work. However, Mitch reminds us that any project worth doing, is a project that should be daunting. And if you set yourself up for success, you will be successful. We end the show with a discussion about the importance of networking and being part of a professional association. Julia asks about Mitch’s involvement in the Canadian Marketing Association. Mitch is a huge advocate of getting engaged in your community and your industry. He reminds young professionals to go in to an association not with the mentality of what will “I” get out of this, but what can I bring to the association and to the people I meet. A most fascinating conversation this week indeed. Thank you Mitch for coming on the show and sharing your insight. If you are interested in reading Mitch’s latest book, you can purchases it on Amazon. Also, thank you Gini for making the connection. We love you Gini! And thank you, as always, to our listeners. We want to hear from you. What do you think of the current world we live in. What fundamental changes have you experienced in your quest for a career? You can post your comment below or on our Facebook Page, or on our Google+ page, or in our LinkedIn group, or on Pinterest, or send us an email at youngprpros@gmail.com, or send us a message on Twitter @youngprpros, @kristinesimpson or @kentjulia. This entry was posted in Young PR Pros podcast and tagged canadian marketing association, communications, control alt delete, ctrl alt delete, gini dietrich, julia kent, kristine simpson, marketing, mitch joel, PR, pr pros, public relations, twist image, young PR professionals, young pr pros, young professionals, young pros by Kristine D'Arbelles. Bookmark the permalink. I’m glad you had him on. He’s pretty awesome, isn’t he? ← Previous Previous post: Young PR Pros: Episode #63 – How do Ottawa Young Professionals Start Their Day?